WHAT CAN WE CONTINUE TO LEARN FROM RALPH NADER? WHAT CAN WE LEARN ABOUT LIMITING AND CONTROLLING POWERFUL INTERESTS? Ralph Nader: a vilified prophet. Mediocre people never recognize greatness in their midst. 1) Would Nader have jumped in the 2008 race if John Edwards had stayed in? 2) Across America are citizens’ concerns being adequately addressed regarding corporate greed and corruption, undue influence of powerful interests and the well-paid lobbyists hired to represent their interests ie. BIG INSURANCE, BIG DRUGS, BIG OIL…that appear to create dysfunctional government at all levels and that fails to meet our basic infrastructural needs in our 21st Century for our American citizens collectively and individually and our America at large? 3) Will Nader’s bid open further dialogue and discussion regarding our domestic and foreign policies, and our allocation of our human and financial resources? 4) Can and will citizens implement a Congressional watchdog organization, district by district across America, in our best interests; to insure our citizens’ concerns and interests are being addressed and served; and to insure that we have full disclosure and transparency in order to make informed decisions and to take informed actions? WE must be informed and that includes having a free and active press. WE must face and own our problems in order to make productive changes, and in order to take productive actions… WE must as citizens have a meaningful opportunity to be heard, and to be judged and treated fairly. WE are together; WE are America. Let us collectively and individually take responsibility. HOPE is based upon knowledge, understanding and acceptance, and positive actions. Let’s boldly and constructively move forward together. Feb. 24: Ralph Nader sits down with Tim Russert for an exclusive interview. Plus, a political roundtable with insights and analysis on Clinton vs. Obama and McCain vs. the New York Times — featuring David Brooks, Doris Kearns Goodwin, Michele Norris and Chuck Todd. MR. TIM RUSSERT: Our issues this Sunday: Many Democrats accuse this man of draining votes from Al Gore, which helped elect George W. Bush in 2000. Will he run again as an independent candidate for president in 2008? We will find out this morning. Our guest, Mr. Ralph Nader. Then, The New York Times vs. John McCain. SEN. JOHN McCAIN (R-AZ): And I’m very disappointed in the article, and it’s not true. MR. RUSSERT: Clinton vs. Obama. SEN. HILLARY CLINTON (D-NY): Shame on you, Barack Obama. It is time you ran a campaign consistent with your messages in public. SEN. BARACK OBAMA (D-IL): You can’t be for something or take credit for an administration and 35 years of experience, and then, when you run for president, suggest somehow that you didn’t really mean what you said back then. It doesn’t work that way. MR. RUSSERT: New polls in Ohio and Texas, and the very latest NBC News delegate count. Insights and analysis from David Brooks of The New York Times, presidential historian Doris Kearns Goodwin, Michele Norris of NPR’s “All Things Considered” and Chuck Todd of NBC News. But first, in 2000 and 2004, to the angst of many Democrats, Ralph Nader ran for president of the United States as a third party candidate. Will he run again this year? He’s with us to announce his decision. 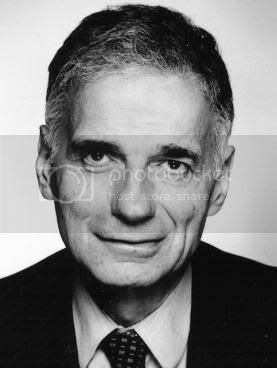 MR. RALPH NADER: Thank you. MR. RUSSERT: Will you run for president as an independent in 2008? MR. NADER: Let me put it in context, to make it a little more palatable to people who have closed minds. Twenty-four percent of the American people are satisfied with the state of the country, according to Gallup. That’s about the lowest ranking ever. Sixty-one percent think both major parties are failing. And, according to Frank Luntz’s poll, a Republican, 80 percent would consider voting for a independent this year. Now, you take that framework of people feeling locked out, shut, shut out, marginalized, disrespected and you go from Iraq to Palestine/Israel, from Enron to Wall Street, from Katrina to the bungling of the Bush administration, to the complicity of the Democrats in not stopping him on the war, stopping him on the tax cuts, getting a decent energy bill through, and you have to ask yourself, as a citizen, should we elaborate the issues that the two are not talking about? And the–all, all the candidates–McCain, Obama and Clinton–are against single payer health insurance, full Medicare for all. I’m for it, as well as millions of Americans and 59 percent of physicians in a forthcoming poll this April. People don’t like Pentagon waste, a bloated military budget, all the reports in the press and in the GAO reports. A wasteful defense is a weak defense. It takes away taxpayer money that can go to the necessities of the American people. That’s off the table to Obama and Clinton and McCain. The issue of labor law reform, repealing the notorious Taft-Hartley Act that keeps workers who are now more defenseless than ever against corporate globalization from organizing to defend their interests. Cracking down on corporate crime. The media–the mainstream media repeatedly indicating how trillions of dollars have been drained and fleeced and looted from millions of workers and investors who don’t have many rights these days, and pensioners. You know, when you see the paralysis of the government, when you see Washington, D.C., be corporate-occupied territory, every department agency controlled by overwhelming presence of corporate lobbyists, corporate executives in high government positions, turning the government against its own people, you–one feels an obligation, Tim, to try to open the doorways, to try to get better ballot access, to respect dissent in America in the terms of third parties and, and independent candidates; to recognize historically that great issues have come in our history against slavery and women rights to vote and worker and farmer progressives, through little parties that never ran–won any national election. Dissent is the mother of ascent. And in that context, I have decided to run for president. MR. RUSSERT: As you know, Ralph Nader, they’ll be Democrats all across the country who are going to find this very disturbing news, and they’ll point again to 2000. This was the vote count. Al Gore winning the popular vote, but you’ve got 2.7 percent, nearly three million votes, in 2000. Then Florida, Florida, Florida. As you remember, George Bush won Florida by 537 votes. You’ve got 97,488. Democrat after Democrat says to this day, Ralph Nader, if your name had not been on that ballot, Al Gore would’ve carried Florida. Exit polls show he would’ve carried Nader voters 2-to-1. Gore would’ve been president and not George Bush. You, Ralph Nader are responsible for what has happened the last seven years. , would tell you if he won Tennessee, anything else being equal, he would’ve been president. It’s his home state. If he won Arkansas, everything else being equal, he would’ve been president. The mayor of Miami sabotaged the Democrats because of a grudge, didn’t bring thousands of votes out. Quarter of a million Democrats voted for Bush in Florida. There is all kinds of thievery in Florida. So why do they blame the Greens? Why do they blame the people all over the country who are trying to have a progressive platform, not just the environment. What was their crime? Why, why, why isn’t there tolerance for candidates’ rights the way there is a building tolerance over the last 50 years for voter rights? Because without voter rights, candidate rights don’t mean much. And without candidate rights–more voices and choices–voter rights don’t mean much. I–I’m amazed at the liberal intelligencia here. They are analytic and they deal with all kinds of variables, but when it comes to 2000 election, it’s just one variable. And I might add that Solon Simmons and other scholars–he teaches at George Mason–have shown that by pushing Gore to take more progressive stands, he got more votes than the votes he allegedly–were withdrawn from for the Green party. Twenty-five percent of my vote, according to a Democratic pollster, exit poll, would’ve gone to Bush. Thirty-nine percent would’ve gone to Gore and the rest would’ve stayed home. Every major–every third party in Florida got more votes than the 537 vote gap. So let’s get over it and try to have a diverse multiple choice, multiple party democracy the way they have in Western Europe and Canada. This bit of, of spoiler is really very astonishing. These are the two parties who’ve spoiled our electoral system, money, they can’t even count the votes, they steal–the Republicans steal the votes, and the Democrats knock third party candidates off the ballot. That’s their specialty these days. MR. RUSSERT: …which you’re going to–just made this morning on MEET THE PRESS and yesterday. MR. RUSSERT: This is what Obama had to say. Let’s watch. SEN. OBAMA: He had called me, and I think reached out to my campaign–it--my sense is that Mr. Nader is somebody who, if you don’t listen and adopt all of his policies, things are not substantive. He seems to have a, a pretty high opinion of, of his, his own work. In many ways, he is a heroic figure, and I don’t mean to diminish him. But I do think there’s a sense now that, you know, if, if somebody’s not hewing to the Ralph Nader agenda, then you, you must be lacking in some way. MR. NADER: Well, first of all, compare my Web site, votenader.org, and all the issues that Mr. Obama and Senator Clinton and Mr. McCain are not addressing that are supported by a majority of the American people. A majority of the American people support these issues. They want foreign and military policy not to just be an aggressive military situation. But Senator Obama is a person of substance. He’s also the first liberal evangelist in a long time. He’s run a brilliant tactical campaign. But his better instincts and his knowledge have been censored by himself. And I give you the example, the Palestinian-Israeli issue, which is a real off the table issue for the candidates. So don’t touch that, even though it’s central to our security and to, to the situation in the Middle East. He was pro-Palestinian when he was in Illinois before he ran for the state Senate, during he ran–during the state Senate. Now he’s, he’s supporting the Israeli destruction of the tiny section called Gaza with a million and a half people. He doesn’t have any sympathy for a civilian death ratio of about 300-to-1; 300 Palestinians to one Israeli. He’s not taking a leadership position in supporting the Israeli peace movement, which represents former Cabinet ministers, people in the Knesset, former generals, former security officials, in addition to mayors and leading intellectuals. One would think he would at least say, “Let’s have a hearing for the Israeli peace movement in the Congress,” so we don’t just have a monotone support of the Israeli government’s attitude toward the Palestinians and their illegal occupation of Palestine. MR. RUSSERT: But would you prefer, as an American citizen, to have Barack Obama or John McCain as president? MR. NADER: What I prefer as an American citizen? MR. NADER: You’re asking me? I’m running for president, for heaven’s sake. MR. RUSSERT: But as a citizen. MR. NADER: I would prefer that the American people organize, that whoever is in president–is president, they give that person backbone. MR. RUSSERT: How would you feel, however, if Ralph Nader’s presence on the ballot tilted Florida or Ohio to John McCain and McCain became president, and Barack Obama, the first African-American who had been nominated by the Democratic Party–this is hypothetical--did not become a president and people turned to you and said, “Nader, you’ve done it again”? MR. RUSSERT: But you do see differences between Barack Obama and John McCain on the war, on tax cuts, on the environment, on a lot of issues? MR. NADER: Yeah. There are differences, obviously. The question is not whether their differences verbally or what they put on their Web site, the question is what is their record? Senator Obama’s record has not been a challenging one. He’s not been a Senator Wellstone or Senator Abourezk or Senator Metzenbaum by any means. He has leaned, if anything, more toward the pro-corporate side of, of policymaking. The issue is, do they have the moral courage? Do they have the fortitude to stand up against the corporate powers and get things done? Yes, get things done for the American people? 1950, President Truman proposed universal health care. We still don’t have it. We have the worst tax system, perverse incentives that rewards the speculators on Wall Street. Why aren’t we taxing speculation on Wall Street instead of heavily taxing human labor and sales taxing necessities like food and appliances and furniture and clothing? There’s no debate on this. William Hartung, the independent military analyst, wrote an article the other day saying there’s no debate on the bloated military budget, on how best to defend this country without breaking the federal budget and putting huge deficits on the backs of our children and their grandchildren. We need to shift the power from the few to the many. And always in American history, every social justice movement was a shift of power from the few to the many. Maybe the slogan should be “Power to the babies.”MR. RUSSERT: On Wednesday it’s your birthday. Happy birthday. MR. RUSSERT: You’ll be 74 years old. You would be the oldest man ever elected president of the United States. You’re older than John McCain. MR. NADER: Thank you very much, Tim. I really like that. MR. RUSSERT: It’s an issue that has been discussed about John McCain, and I’m presenting it to you. MR. NADER: First of all, I thought David Letterman was very unfair in the way he made fun of John McCain’s age. Very, very–I mean, really overboard. I mean, humor has no limits, obviously. But second, someone once said the only true aging is the erosion of one’s ideals, and I want the people out there just to look at our Web site and see how exciting it’s going to be. I’ve been assured by my computer/Internet literate associates–I grew up in the Underwood typewriter age, you know–that this is going to be the most exciting, informative, participatory Web site of any presidential campaign, votenader.org. And on that Web site now, Tim, is a declaration that we will receive no money from commercial interests, no money from political action committees, only from individuals. And I’ll take it from any individuals--Democrat, Republican, Libertarian, independent, Green party. And, and we are very frugal. They’ve labeled me Mr. Frugal, my, my associates. We know how to use it. None of this huge waste on political consultants who have really messed up Hillary Clinton’s campaign. MR. RUSSERT: You heard Barack Obama say that in many ways, you’re a heroic figure. You were first on MEET THE PRESS in 1966, you said that you would never run for elective office back then. This is your third run for the presidency. Are you concerned now, when people look back at Ralph Nader, they’ll consider him the Wendell Willkie of his generation, someone who kept running and running for president with no chance of winning, which will diminish the legacy that you tried to carve out as a consumer advocate. MR. NADER: No, Tim. My concern doesn’t proceed from that. I came to Washington over 40 years ago to help improve my country and, and started a lot of citizen groups who did that. That was a time you had a hearing in Congress, regulatory agencies like the Food and Drug Administration would be more responsive–Auto Safety Agency, EPA. That’s a time Nixon, because he heard the rumble of the people, and he was the last president to really fear liberals enough to change his position, signed OSHA, signed EPA, had a health plan that he didn’t really believe in, had a minimum income plan to abolish poverty, and then it started. Around 1979, the doors started closing on the citizen groups. So my concern, Tim, comes from, to give you statistics quickly, 58,000 workers who die every year from work-related diseases and trauma on the job; 65,000 people according to EPA who die from air pollution; over 100,000 people who die from adverse effects of medicines; 250 people a day who die from hospital-induced infections; and all the fraud, waste and abuse that’s eating at the heart of the family budget, aggravating them. They can’t get answers to their questions. They’re thrown into huge debt. Now they’re losing their houses while White House–while Wall Street speculators laugh all the way to the bank. That’s where my concern comes from. And I hope it’s shared by a lot of people around the country. I hope a lot of people will be gathered around the country to establish Congress watchdogs in every district, a thousand people–we want to hear from very congressional district–to show the American people how easy it is to turn the Congress around if people are organized. Fifteen hundred corporations get their way by–from a majority of 535 members of Congress. We’re millions of people out there, and we simply have to, for the sake of our children and grandchildren, and the state of our nation in the world, we have to mobilize in that manner, and that’s what that, that Web site is all about. It’s not just a Web site. It’s a gathering center, votenader.org. MR. RUSSERT: Ralph Nader, we thank you very much for joining us, making your announcement and sharing your views. MR. NADER: Thank you very much, Tim. Thank you. < br style="line-height: 1.22em" />MR. RUSSERT: Coming next, John McCain fights back against The New York Times. And Hillary Clinton and Barack Obama, they debated Thursday, and they’re getting ready to debate again this Tuesday in Cleveland, Ohio. Our roundtable is next–David Brooks, Doris Kearns Goodwin, Michele Norris, and Chuck Todd–only on MEET THE PRESS. Posted in AMERICAN BRAINWASH, CORPORADOES, IDEOLOGICAL COMBAT, THE LEFT & PSEUDO LEFT, TOXIC CULTURE and Tagged american elections, clinton, mccain, meet the press, obama, ralph nader, tim russert.